Much has been said about this coming fall, the highest watch season we have ever seen. JD Farag refuses to set dates (as he should), but admits September will see a convergence of events unlike anything that has come before. The danger in getting hyped-up is that should the LORD tarry, many will be discouraged and could lose faith, but on the other hand we are told to watch for His coming and to know the season. As JD explains, better to blow the trumpet than not. Better to be ready, than have your head in the sand, focused on the cares of the world. While the Bible does indicate we can't for sure predict the exact day or hour of Christ's coming, we most certainly can predict the season and observe the enormous convergence of prophetic events. As John Haller explained just a few short weeks ago, the prophetic "setting" is now complete in regards to "as in the days of Noah" and "as in the days of Lot". Nothing more needs to happen. Previously, we've demonstrated a possible 2015-2022 tribulation timeline. Additionally, over at RITAN, it was recently pointed out that the full length of the tribulation (1260 days + 1335 days = 2595 days) fits almost exactly between the first day of Rosh Hashanah 2015 and the last day of Tabernacles (Sukkot) 2022. And now for the BOMBSHELL: the upcoming conjunction of Jupiter and Venus in Leo the Lion on June 30th may in fact truly be the reappearance of the Star of Bethlehem that appeared in 2 BC heralding the first coming of Christ. 1. 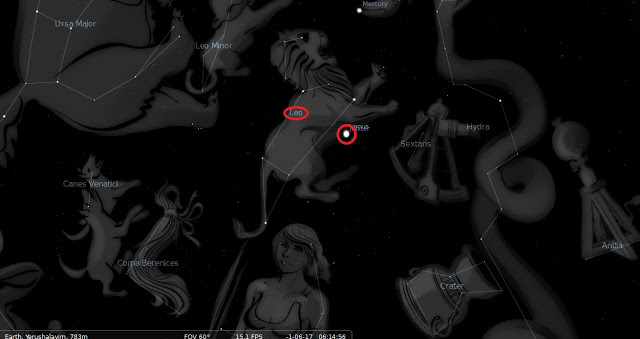 On Rosh Hashanah, September 11th, 3 BC, the king planet Jupiter entered retrograde around the king star Regulus in Leo the Lion (it circled around it like a halo three times). The date of Christ's conception? 2. Then Jupiter began moving on again from east to west and after exactly the length of a human gestation (about nine months later) it appeared to form a single star in conjunction with Venus to become the brightest star anyone up to that point had ever seen. This occurred on June 17th, 2 BC. The date of Christ's birth? 3. From Jerusalem it appeared to move south to Bethlehem where it again stopped (entered retrograde), actually on December 25th, 2 BC. These events fit with all nine requirements of the Biblical Star of Bethlehem. 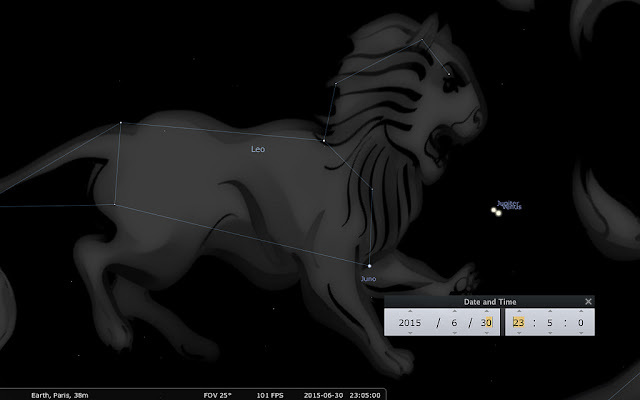 We and other watchers have been talking about how Jupiter and Venus were again going to form a single super-bright star in Leo the Lion on June 30th of this year (in one week) just like what happened on June 17th of 2 BC. Amazing in itself. That is until a watcher over at RITAN discovered that the Julian calendar date of our June 30th is actually June 17th. The Julian calendar was the calendar in use at the birth of Christ. In other words, using the same Julian calendar, Christ's star heralding His advent appeared first on June 17th, 2 BC, and is now appearing again on June 17th, 2015. This is unprecedented, remarkable, and quite frankly amazing, even for a watcher. Though they haven't taken notice of the Julian calendar line-up, even CBS News is reporting on this upcoming conjunction specifically in relation to the previous 2 BC conjunction. 11 days were added to sync the calendar. While I agree no one knows when He will return, interesting the aligning events all pointing to this summer and fall. Jesus of course ascended 40 days after His ascension. If He was crucified on Friday April 3rd, 33ad, then 40 days later was 5/13/33ad. 2011 x 360 (the length of a Jewish year) = 723,960 days or 6/30/2015. Hosea 6:2 says that He will revive us after two days and as Peter says a day is as thousand years. John 4 speaks of Christ's time with the Gentiles being two days long. If the two days fulfills 2,000 years, what of the remaining 11 years. 11 - number of surviving Apostles. At the end of 11 years, is 12. 12 has many meanings - all perfection. Revelation 2:10 speaks of waiting through 10 days of tribulation. Revelation 3:11 (1 more chapter - 1 more verse - emphasis '11') says 'behold I am coming quickly'. If you back up to the day of the cross the number of days between 4/3/33 and 6/30/2015 is a very round 724,000. Of course this is probably all garbage, but whenever He returns the dates, stars, signs, prophecies will all be in perfect alignment - so watch and pray. Also June 30th is 77 days before The feast of Trumpets. Great thoughts! The days line up very, very nicely. I'm wondering if this is the sign indicating the Second Advent of Christ is at hand. Also, regarding the Julian date: the Julian was in use until 1582 when 10 days were added to form the Gregorian. Since then, 1 additional day is added every 128 years to the initial 10, which is why in 1752 the difference was only 11 days, but now in 2015 the difference is 13 days. are we as followers of Christ SUPPOSED TO BE followers of numerology etc ? same for planets alignment ? shouldn't revelation knowledge on having an ETERNITY WITH HIM be enough ? Hello Anonymous. I think you are confusing some things. We don't practice numerology or astrology. Those are pagan things that teach that numbers and stars can control you and determine your future. We don't agree with that and we don't practice that. On the other hand, the Bible clearly says that on the fourth day of Creation (in Genesis 1) God made the sun, moon, and stars to serve as signs for God's appointed times/festivals. Jesus also said that there would be "signs in the heavens". Rejecting that truth is disobedient. Lastly, regarding the coming of Christ, He commanded His followers to watch many times. Paul said the same many times. Refusing to do so is to reject God's Word in disobedience. Matthew 13: You better have oil in your lamp. He is coming and He is coming soon. With that said, no one can know the exact day or hour, but we can and SHOULD be aware of the season and the convergence of signs.